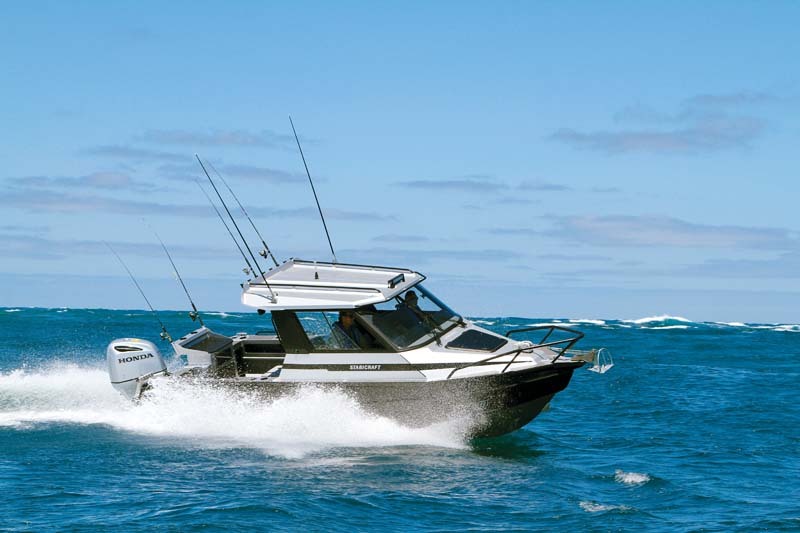 The Stabicraft 2400 Supercab is an aluminium fishing boat package that has been the subject of much expectation, as this new boats fills a gap between the Stabicraft 2100 and 2600. "They’re big, they’re tough, they’re solid, they’re eminently sea-worthy and they ride very, very, very well," is how chief boat reviewer John Willis describes the new Stabicraft 2400 Supercab. These boats are commonly acquired for professional use, including, commercial users, police, rescue services and even fire brigades. When you see the layout and design, you can understand why. The Stabicraft 2400 Supercab incorporates the new "Arrow" pontoons with a new, narrower entry that give the boat a completely different feel at the front end. The design does an extraordinary job of cancelling slapping and banging. Another feature on the new Stabicraft 2400 Supercab is the Game Chaser transom. "They’ve elongated the keel line all the way to the back of the boat, right up to the transom," says John Willis. "It’s given us some great reversibility. When you’re on that big fish chasing it around in reverse, you can actually motor around with a good bit of speed without getting wet or drowning your outboard motor," he says. Read in full our Stabicraft 2400 Supercab review. "You can’t even hear it running at idle speed," is how John Willis describes the 250hp Honda outboard motor on the back. "It absolutely tears on the water but it’s as quiet as a mouse. It’s probably one of the smoothest and nicest notes I have ever heard in an outboard motor," he says. The Stabicraft 2400 Supercab is — apart from its well-known commercial applications — at its core a superb fishing boat. Even better, acquiring one with a different layout and options is of course perfectly feasible. Our review boat had an extended cabin but if you prefer a camper version or an enclosed cabin, Stabicraft can do it for you. There are no shortage of variety and options, but the common theme is that they’re all based around an inherently safe aluminium hull with a very solid build and exceptional ride. We test the hot new Stabicraft 1850 Supercab. Join us for a ride aboard the Stabicraft 2600 Supercab. Find Stabicraft boats for sale.